Cleans as it clings! If you are using a pumice stone this will change your life. No bleach - you will love the fragrance during and after use. The only Toilet Bowl cleaner that actually clings to the bowl surface until clean! Many bowls considered "too far gone" will be restored to as new! Tip: Mix and match with all 16 oz size products such as Shower Stall & Cleaner and/or Liquid Garage & Driveway Cleaner to fill your case for promo discount. NOTE: For toilet bowls only! Do not use on tile, bathtubs, sinks, any metal surfaces, or with Chlorine or other chemical products. If spilled on wood or clothes rinse promptly with clear water. Directions: For best results, remove as much water as possible from bowl. Tip– water can be cleared from bowl by turning off tank supply and flushing toilet, or rapidly pouring a bucket of water down bowl. Apply Cling ‘n’Clean directly to the surface of the toilet bowl using a toilet bowl brush. (It will cling to the bowl’s sides.) Add more Cling ‘n’ Clean to the water. Let stand for a minimum of 10 minutes. After 10 minutes brush the bowl thoroughly and flush with clean water. For old, stubborn stains, a second application may be necessary. When our father passed away we had to clean up some severe neglect in his bath. We though we would have to pull the toilet and buy a new one. Lots of rust and stains. But, this product brought the toilet back to like new condition. Saved our bacon. The before and after pics on their other site edfredcorp.com are similar to our results. It worked beautifully! A 30 year problem solved!! It's not often that happens. I followed your instructions - cleared out almost all the water. Less than 1/2 a cup was left. Then I poured in your Cling N Clean. swished it around with the brush, and forgot about it. 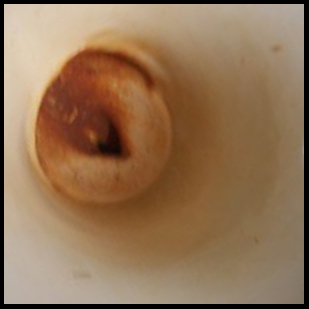 When I returned, I flushed once and the stain was completely gone. It really works! stopped carrying Kling 'n Clean. They ordered me a case of it because I bugged them so much. Now I can order it on line. This is a product that absolutely works exactly as advertised. Had a very old bottle of the toilet bowl cleaner. Don't remember where I even bought it. Had just a small amount left and used it as I tried EVERYTHING else to remove stains in toilet. Worked like magic. Then went online to see if company was still in business and if I could order online. Great news - there you were and I placed my order. Thank you. Just to let you know that lime-deposit-encrusted toilet here in Tularosa NM is now spotless! Wendell said, "That stuff's a miracle...I had tried everything on the market." My reply, "I told you it would work!!" Thanks. I absolutely adore your toilet bowl cleaner. It is the only one that works in the whole country. Keep doing what your are doing. I used to buy it at DoIt in Valencia but when I asked for it this time the girl told me she did not know anything about it. After 3 years of use and many a toilet bowl transformed, I keep one bottle in each bathroom for daily swishing...no icky smell or bleachy fumes...saves time and money...kudos to EdFred! This product works great and I would use no other toilet bowl cleaner again. It takes out stains very quickly. I put it in the toliet and let sit about 15 minutes, scrub and the toliet is spottless everytime. Love the toilet bowl cleaner. Amazing! In 2008 I bought a 70s townhouse in an area with hard water. The toilets were stained and I tried lots of scrubbing products with no real results. I tried EdFred toilet cleaner this weekend and within minutes I saw a change. Wow! Looks like I won’t be saving up for new toilets. I have been using your bowl cleaner for a long time and now I can't find it anywhere. I live in the Ceres/Modesto area. (95350) I would like to know where I can find the product. It is the best bowl cleaner I have ever used. So glad to find Edfred on line. 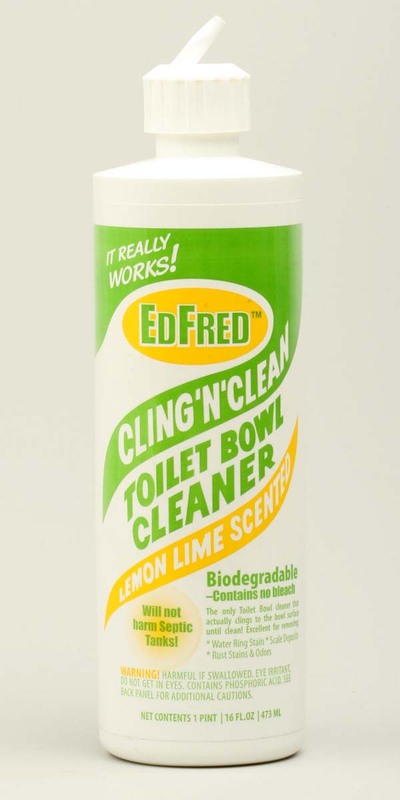 I had not been able to find the Edfred toilet bowl cleaner for a long time and it is super. Ordered serveral on line and received it in just a few days. Very happy to find your products on line. Thanks!!! Didn't think it would work on my calcified toilet. Emptied the bowl with a wet-dry vac then let it soak in the goo for 10-15 minutes. Scrubbed with a plastic brush and the mineral deposits started flaking off. Repeated the process once and was able to flake off all the deposits. Now my bowl is clean! 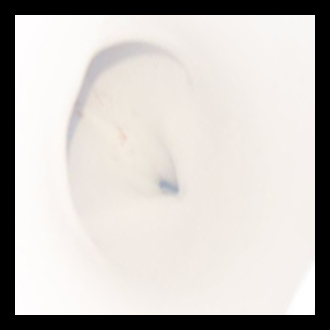 The discoloration in our toilet bowls was driving me crazy because I had tried several things to make them white again. Used EdFred’s product and the results were outstanding. Have recommended them to several friends, including one who has a vacation home on a ranch that she believes will be helped by using this in their bathrooms. Really appreciate finding a great product like this. let it sit overnight on a bad toilet ring, the whole toilet was saturated with the product. Nothing happened?? product does not work. I cannot begin to thank you for making EdFred Toilet Bowl Cleaner. We have hard, orange ish water and my toilet bowls were a nightmare. I was embarrassed, however, nothing I used completely cleaned my toilets. This did. The nice lady at Ace Hardware in Morgan Hill, California HIGHLY recommended your product and I am SO happy I took her advice. I am now shouting from the rooftops and to anyone who will listen how AWESOME your product is. SO THANK YOU!!!!!!!!!!!! I've used the product and recommend it to customers all the time, as a plumber of 27 years this has been the very best product I have found that works. I have found removing the water from the bowl and letting the product sit for about 30 minutes and run a soft bristle toilet brush around a few times and it's like magic. I have been using your bowl cleaner for a long time and now I can't find it anywhere. I live in the Ceres/Modesto area. (95350) I would like to know where I can find the product. It is the best bowl cleaner I have ever used.